On a bright and sunny morning, the St Mary and St Giles School Orchestra and the Church Band joined forces, with Lesley Salter conducting, to present the audience with a medley of old and new – music from the 1940s alongside presages of the blossoming of Spring. We were swept along at the beginning of the concert by an enthusiastic rendering of ‘Food, Glorious Food!’ Vivaldi’s ‘Spring, Allegro movement’ from ‘The Four Seasons’ followed, with a lyrical and atmospheric performance by the orchestra and band. 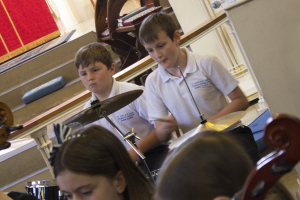 Real musical concentration was apparent as this famous piece was played. Peter Eales delighted the audience by singing the poignant ‘A nightingale sang in Berkeley Square’, a song composed in 1939 and sung recently at the VE DAY 70 celebrations this year. And with the 75th Anniversary of the Dunkirk Evacuation taking place, a joyful performance of ‘Pack up your Troubles’ reminded us of the sacrifice and courage so evident in the war years. 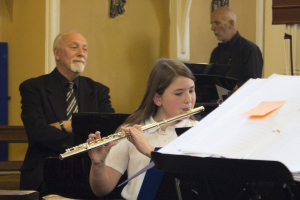 St Mary and St Giles School pupil, Izzie, followed this with a solo of ‘Oom-pah-pah’, very powerfully and accurately played. The Church Band then took us on ‘A Sentimental Journey’, a graceful melody from the 1940s, and continued with the theme from ‘The Great Escape’, where the rousing beat had feet tapping and fingers snapping. ‘Edelweiss’ neatly combined the motifs of thoughts of one’s homeland with hope of new life blooming. 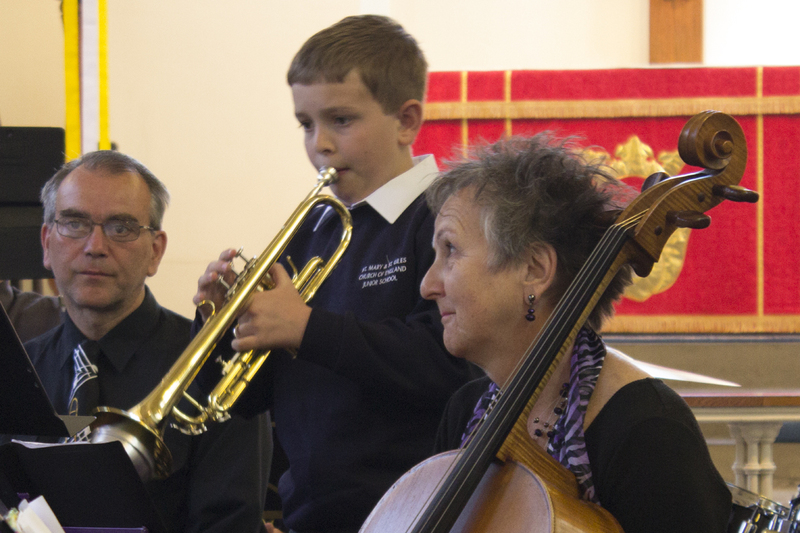 As the concert moved to its finale, Jamie gave us a tremendous trumpet solo, earning a well deserved round of applause. ‘The Lion Sleeps Tonight’ and Holst’s ‘Jupiter’, from ‘The Planets Suite’ brought the performances to a punchy ending and again the applause rang out. 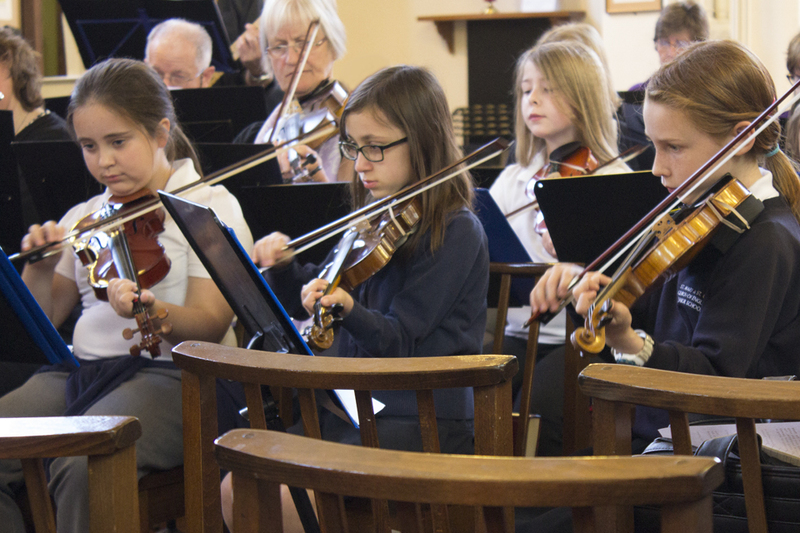 The skill and commitment of the School Orchestra and the Church Band ensured a very enjoyable lunchtime concert for all. Thanks to those who performed, made tea and coffee and all those who helped in any way. As a bonus £37.09 was donated in a retiring collection for the organ casework.